George Henry Mackenzie was born in Ross-shire, Scotland, on March 24, 1837. He was educated mainly in Aberdeen, at the grammar-school and the Marischal College in that city; but he studied in Rouen, France, and Stettin, Prussia, during 1853, '54, and '55. During the next year he entered the British army as an ensign in the 60th Rifles. Soon after, the regiment was sent to the Cape of Good Hope, and thence to India. Mr. Mackenzie returned to England in November, 1858, having been promoted to the rank of lieutenant. In 1861 he sold his commission and retired from the army. Meanwhile he had attained considerable proficiency in chess, having begun to practise the game in 1853, and being by this time known in the London clubs as a player of no little force; and the fact was publicly demonstrated in 1862, when he won the first prize of the Handicap Tournament in London, at which many of the doughtiest European players of their day broke lances. In the following year he came to America, entered the Union army, and served therein until 1865. The first American Chess Congress was held under the auspices of the New York Chess Club, as has been said, in 1857; but it was not until 1871 that the next congress was held; and in this, at Cleveland, Ohio, Captain Mackenzie carried off the first prize. The third congress came more quickly; it convened in Chicago in 1874, and here again Captain Mackenzie captured the first prize. 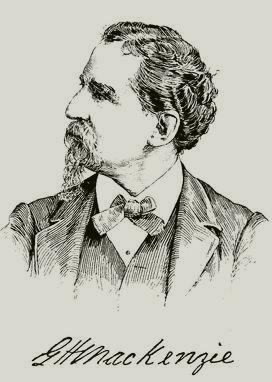 In the International Chess Congress of 1878, held at Paris, he was less fortunate, gaining the fourth prize only; but he had to meet a most formidable array of competitors. His star blazed up afresh at the fifth American Chess Congress, at New York, in 1880, for here he again won the first prize. The next International Congress was gathered in Vienna in 1882, and there Captain Mackenzie tied with Herr Zukertort for the fourth prize. At the ensuing congress of London, in 1883, he tied with Messrs. Englisch and Mason for the fifth prize. At Hamburg, in 1885, in a like assemblage, he won the seventh prize; and finally, at the International Chess Congress of Frankfort held this year (1887), Captain Mackenzie capped the climax of his chess achievements by winning the first prize, and with it the title of "Chess Champion of the World." It will be seen by this list of his more prominent deeds that the champion has not snatched his laurel by the grace of any mere freak of fortune. He has not climbed in at the cabin windows. His success has been gained, rather, as the fruit of long and patient effort. Like the famous warrior of his race we have named, he has fought it out on his chosen line with dogged perseverance, until the loftiest result, the supremest distinction, has been fairly accomplished. Of that result or distinction Americans may be justly proud. It is a great feather in the national cap--for twenty-five years of life among us and service in our army justify the claim--the more to be cherished in that it has never been worn before. Mr. Morphy's splendid performances brought him a towering reputation. His victorious matches with Lowenthal, Harrwitz, Anderssen, and others electrified the chess world, and elated his countrymen, if never his modest self. But, as a matter of fact, Morphy never won the first prize at an international tournament. It may be said, and plausibly, that this was only because he never entered one. But whatever the reasons, the fact remains the same; and the record shows, in fine, that George Henry Mackenzie is the first American who has yet won the first prize at an international chess tournament, and the title that precedent confers on such a winner of "Chess Champion of the World." History repeats itself. The American Chess Congress of 1857 and that of 1887 (for if the latter does not meet this year, it will do so, we are told, early in the next), the meteoric rise of Morphy and the unique triumph of Mackenzie, offer suggestive parallels. It is foreign to the present design to enter upon a discussion of the comparative merits of these or any chess-players; but some hints as to chess culture, and notably as to the formation and conduct of chess clubs, may usefully and pertinently be drawn from experience and applied to the existing situation. Thirty years ago, or, more strictly, in 1859-60, chess, brought into fashion by Morphy, became almost a craze. Folk of both sexes, of all ages, and of every occupation bought boards and hand-books, and set themselves to the study of the pieces and squares. Chess clubs were formed in every direction, and some of them have continued to flourish to this day. It was, notwithstanding, early seen that something more than temporary enthusiasm in such organizations was essential to their permanent prosperity. To carry on clubs costs money, and although chess clubs are not so expensive as others, even they need the sinews of war. Now men seldom care to continue to pay money for that which no longer interests them, and after the first flush of excitement over its novelty, even the king of games, for not a few, loses its charm. It is therefore wise, when it can be done, while putting annual dues as low as possible, to get members to pledge themselves at the outset to a stated permanency. It is likewise judicious to make club-rooms attract apart from the chess tables. This was one great secret of the long-continued prosperity of Mr. Ries's "Grand Divan," in the Strand, London. It possessed a fair library. Good cigars, excellent tea and coffee, and other refreshments could be had instantly at any time. Some of the ablest men in London gathered there, and irrespective of the central feature the Chess Divan, which was a kind of public subscription club, became the favorite resort of a large number of persons, many of whom were in their various walks celebrities. It is, moreover, highly desirable--some experienced experts say indispensable to a club of any size--to have in constant attendance one or more players of acknowledged force and reputation ready to meet all comers. Such persons are not only magnets, but serve at once as umpires and teachers. The presence of Mr. Morphy was chiefly instrumental in building up the exceptional proportions of the New Orleans Club. Mr. Staunton was long the star of the St. George's Club of London. In addition to loftier allurements, the ideal chess-room should be carefully and comfortably furnished. Its chairs, tables, and, above all, pieces and boards, should be of the best. It should be cheerful in aspect, kept fastidiously neat, and as amply supplied with books of reference and current literature as circumstances will permit. All this, it may be objected, means expense. No doubt it does. But the money will be wisely spent. The interest on the difference between a well and ill appointed chess club will be trifling, while the result in comfort, solidity, and permanence may be vital. Those in charge of old chess clubs or who form new ones should never forget that the price of healthful life is necessarily ceaseless activity. They should aim always to get new blood, to stimulate interest in tournaments, problems, correspondence, and chess literature. Chess clubs cannot afford to go to sleep, drowsy as some unappreciative souls find their diversion. A signal instance in point is to be found in the fate of the old New York Chess Club. With all its fame and its hallowed memories, the organization died of dry-rot for want of the energy that might have vitalized and invigorated it. Toward the end it became the ghost of its former self, and finally past away like an exhalation. It was practically moribund before, and when those excellent men and enthusiastic chess-players, Messrs. Mantin, Thompson, and Mead, had played their last games, the club they had so long sustained also surceased. It is manifestly proper to remember, in considering the number and membership of chess clubs, that these constitute only a partial measurement of the practice of chess in any community. Added to the amount of play in domestic life outside of such bodies, a great deal of chess goes on in general clubs, such as the Union League in New York, where active interest is taken in the game. As a final suggestion touching the setting up and maintaining the healthful life of clubs for chess, it may be pointed out that a combination with the practice of other games has sometimes worked well. Such an arrangement is specially adapted to small places where the number of available chess-players is few, and where, by bringing in the players of checkers and perhaps whist, the club may be increased in number without discouragement of the tastes of any persons concerned. Even in large cities this plan has been adopted with satisfactory results, the Westminster Club of London, established for the joint practice of chess and whist, having had a long and flourishing career, the friends of each game being often equally devoted to the other. This article by Henry Sedley is from HARPER'S NEW MONTHLY MAGAZINE (Volume LXXVI, December, 1887 to May, 1888), which is in the public domain. Is Google playing chess with Microsoft?